Many suburban stores are sold out of eclipse glasses, leaving people scrambling to find a pair before Monday afternoon's astronomical event. Several suburban Lowe's and Walmart stores, which were selling eclipse glasses for around $2 a pair, said Monday they've been sold out since last week. American Science & Surplus in West Chicago put a "sold out" sign on its front door Monday, also announcing the news on its Facebook page and voicemail. Manager Megan Slaker said the store sold "thousands" of pairs of eclipse glasses in the past few months -- both the $2 cardstock version and the wraparound plastic version for $17.50. The 2,000 pairs the store had left on Saturday were gone by Monday morning, even though purchases were limited to four per family. Demand has been rising as the eclipse date nears. "We could have sold 10,000 more," Slaker said. "It's to the point where people are going on eBay and Craigslist and buying them for a ridiculous amount of money. I heard a pair of (the plastic glasses) was going for $80 on eBay now. It's crazy." A quick check of Craigslist and eBay showed that, indeed, a secondary market has emerged, with many glasses priced at double their value or higher. 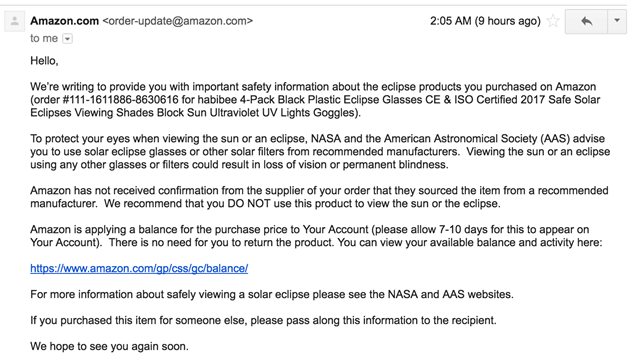 Adding to the stress is Amazon.com's announcement Sunday that it would refund customers who might have purchased solar eclipse glasses that do not comply with industry safety standards. "It's kind of frustrating," said Arlington Heights resident Carol Ficks, who has gone to Jewel, Walgreens and a few other stores in search of a pair of glasses this past week but came up empty. "All of a sudden ... no one can find them." Bill Hobday of Schaumburg has called several stores in search of a pair, but every place has been sold out. He's leery of buying them online and questions why retailers didn't have more in stock, given all the hype about the eclipse. "They probably cost someone 10 cents to make, and the margin on these things has to be awesome," he said with a laugh. "I'm going to keep looking ... but I'll probably end up watching it on TV." If you can't find a pair of eclipse glasses, what should you do? Don't assume your sunglasses will be enough, because experts say looking at the eclipse without the proper eye protection can cause permanent eye damage within seconds. With millions purchasing protective eyewear ahead of the Aug. 21 solar eclipse, Amazon is working to remove potentially counterfeit glasses from its marketplace and issue refunds to those who have already bought them online. A company spokesperson told ABC News in a statement overnight that it asked third-party sellers offering solar eclipse glasses to provide documentation to verify that their "products were compliant with relevant safety standards." "The offers from sellers who provided this safety documentation remain available to customers," the spokesperson said. Sellers who did not provide documentation for their listings have been removed from the site. Amazon did not name any of those listings or specific brands in its statement. Amazon confirmed that it issued refunds to some customers who purchased glasses that may not meet industry standards. 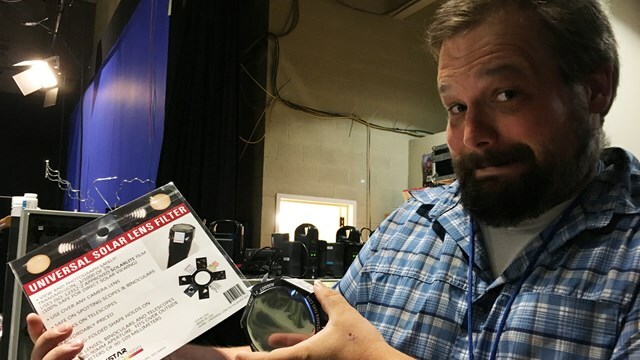 Last week, Fred Espenak, retired NASA astrophysicist and photographer, told ABC News that he has heard rumors of counterfeit glasses being sold online. Espenak, NASA and the American Astronomical Society (AAS) suggest that consumers purchase off the AAS's approved list of companies that manufacture and/or sell eclipse glasses and handheld solar viewers, which have been verified by an accredited testing laboratory to meet the ISO 12312-2 international safety standard. "They've been put through a testing procedure to demonstrate that they're dark enough to prevent visible as well as ultraviolet and infrared light from passing through it," Espenak said. Some companies are placing an ISO label on their counterfeit glasses, which is why following the list of manufacturers is a surefire way to know you're being safe, according to the AAS. Here is a growing list from the AAS of approved companies that manufacture and/or sell glasses through vendors and retailers. 0 Response to "Amazon eclipse glasses recall 'made the problem worse,' AAS says"